Never Enough Nails: Lynnderella Friday, Vol. 59! Happy Friday before Halloween!! I have some decorations up, got my pumpkins this week, and have been watching Halloween movies all week. I also have this mani on right now and I'm loving it! 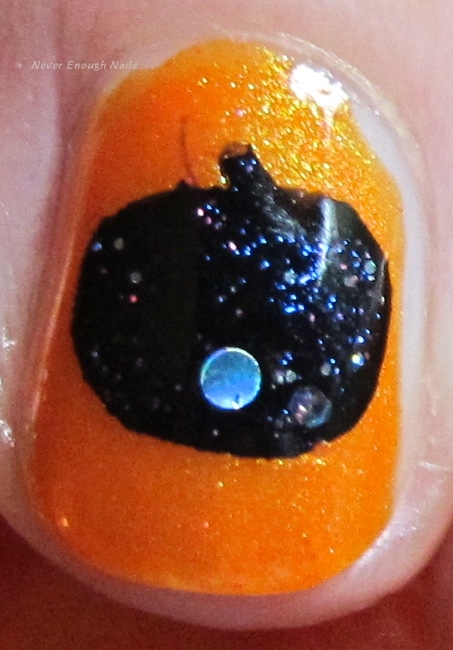 This orange shimmer is a Halloween mystery Lynnderella and it is so excellent!! For the last few weeks, there have been Halloween mysteries with adorable hand-drawn labels available in the Glitter Fairies (Lynnderella Facebook group). I was dying for an orange one, and I managed to snag this one with the cute spider in his web. 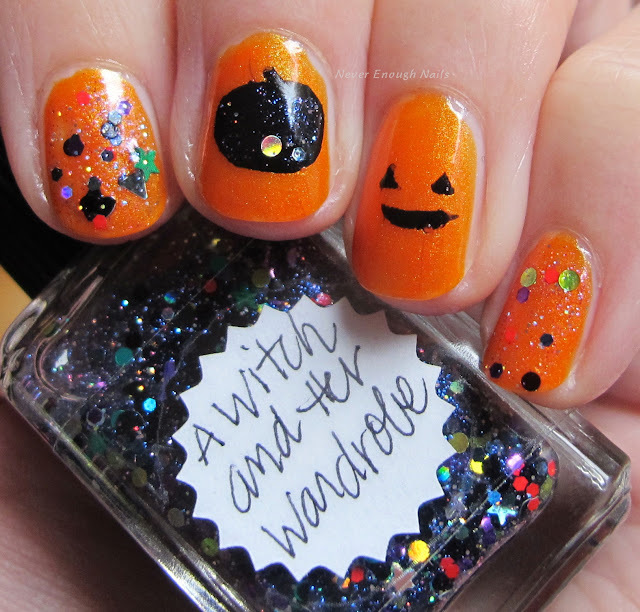 The polish is an orange shimmer with some spooky green shimmers. It's gorgeous! 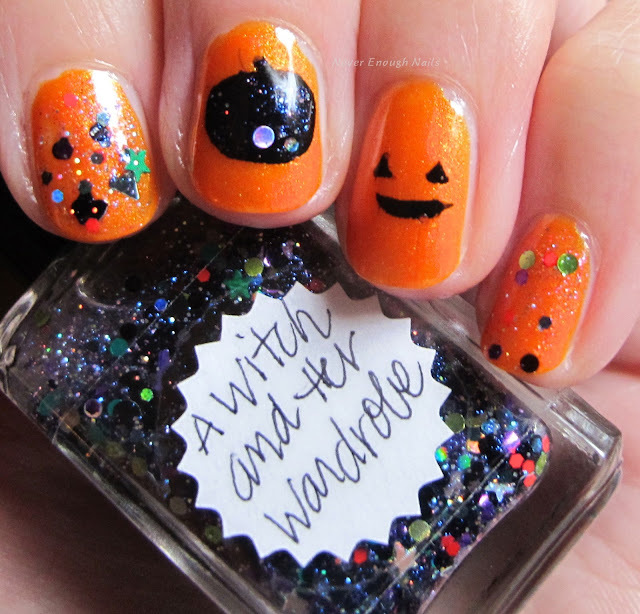 I am also wearing Lynnderella A Witch and Her Wardrobe on my index and pinky nails. This is a new core polish for Halloween and it features bats, witchy slipper pumps, cone hats, flowers and stars in a clear base with blue shimmer and teeny holographic glitters. 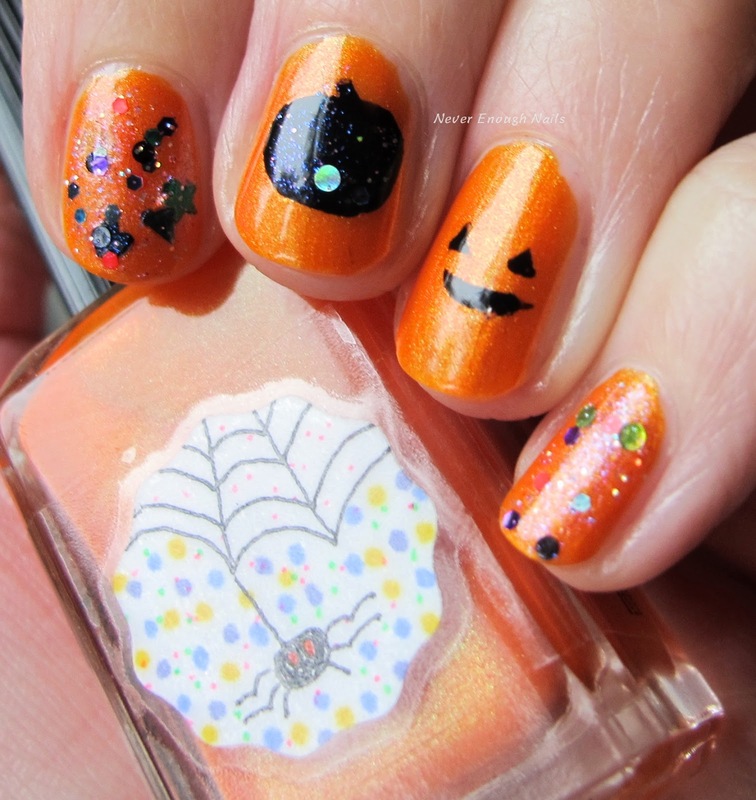 I dabbed a little bit of it on top of my pumpkin on my middle nail too. The pumpkin and pumpkin face on the ring nail were made using Sally Hansen Black to Black with Vibrant Vinyls. Sorry about the weird lighting in these pictures, I had to take them indoors because it was SNOWING when I took these!!! A Witch and Her Wardrobe is available now at lynnderella.com now. This orange mystery is not available, but there are a few Halloween mysteries with the cute hand-drawn labels on http://stores.ebay.com/lynnderella-lynnderella.